Pioneer Monument between Main Library and Asian Art Museum, 2014. This is the Pioneer Monument, now located at a public space between the Asian Art Museum and the Main Library. Since 1894, the 820-ton piece, by then prominent San Francisco sculptor Frank Happersberger, was a feature of the former Marshall Square, at what is now the intersection of Hyde, Grove, and Market Streets. There it served as a frontice piece for the old Paris-inspired City Hall, a disaster of a building begun in 1870, but plagued by shoddy construction and corrupt contracts. Finally completed in 1897, the building met its predictable demise with the earthquake and fire of 1906. But the sturdy monument remained in place until 1993 when it was moved to its current location to make room for the new library. The piece was a posthumous gift to the city from pioneer investor, philanthropist and crank James Lick, who had died in 1876. He had designated $100,000 for a monument celebrating the early history of California. Happersberger did not disappoint, cramming a heavy dose of the state’s past into this cast iron rendering. Atop the monument is the Roman Goddess Minerva standing in allegorically for Eureka, the state’s motto (if that makes sense). Artfully posed beneath and near the goddess are two other draped goddesses representing agriculture and commerce, a Mexican vaquero, a Franciscan padre, a submissive Indian, and a trio of prospectors. A series of bas-reliefs depict more vaqueros, “Trappers Trading Skins With the Indians,” and “California’s Progress Under American Rule.” The names and portraits of all sort of folks prominent in the development of California are also on display. Among those celebrated are Vallejo, Sutter, Stockton, Cabrillo, and—no surprise—James Lick. Lick was a bit of a case. An accomplished and prosperous builder of pianos, he was 50 years old in 1848 when he arrived in San Francisco, 17 days before the discovery of gold. Buying up large hunks of land, he became very wealthy almost instantly. He was a loner, a gaunt man, who walked up and down Market Street in a dirty black suit. He often spent his evenings slinking through the city’s back alleys begging restaurants for bones he claimed he needed for fertilizing his fruit orchards in the South Bay. Despite his oddball behavior, Lick has left a mark on the Bay Area. In addition to the Pioneer Monument there is the Lick Observatory in Santa Clara County, and in San Francisco: Lick-Wilmerding High School, James Lick Middle School, and, rather incongruously, the James Lick Freeway. Marshall Square, 1914. When this photograph was taken, Marshall Square and City Hall Avenue were little more than artifacts of former times. The old City Hall and Hall of Records had been demolished, construction of the new Civic Center was fast moving forward, and both Marshall Square and City Hall Avenue would soon disappear. 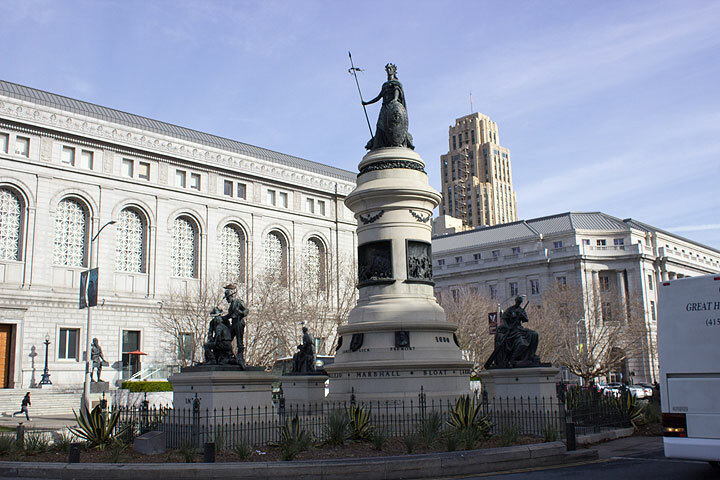 The Pioneer Monument was moved to fit the east/west alignment of the revamped Civic Center, and today it stands between the new Main Library building and the Asian Art Museum at Larkin and McAllister, originally the main public library, which was built where once stood the Old City Hall. Problems for the Pioneer Monument, however, emerged in 1991 when the city decided it needed to be moved to make room for the new library. Indian groups for a long time had had a problem with the rendering of an Indian posed submissively at the feet of an aggressive vaquero while a Catholic father points dramatically toward heaven. These organizations thought it was time to junk the monument. On the other hand, preservationists objected to any move at all as the work marked the location of the old City Hall. The decision was made that, yes, the work would be moved, but a plaque would be added recognizing the humiliation and mistreatment of Native Americans. No one was happy: the Indians, the Franciscan fathers and even the government of Spain complained. Eventually semi-acceptable language was cobbled for the plaque. At the time, Mayor Willie Brown said, “I would suggest that the troubles of these times cannot be corrected by a single plaque.” Likewise, the events of early California history cannot be depicted in a single monument, but Frank Happersberger sure tried his best. 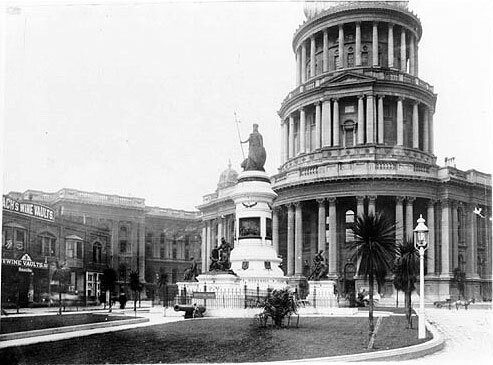 Pioneer Monument, which now sits between the Main Library and the Asian Art Museum, once stood here in front of City Hall sometime between 1897 and 1906. 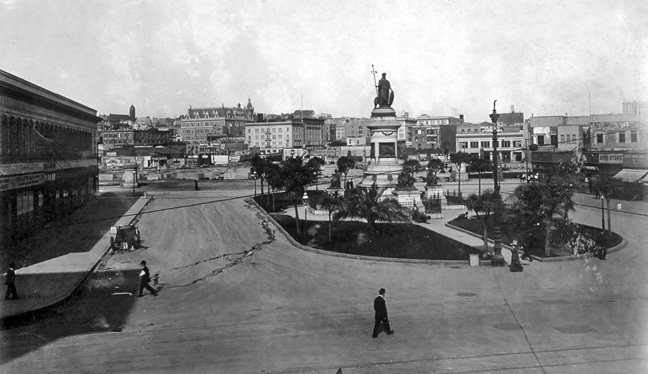 After the 1906 earthquake, this spot became the intersection of Hyde, Grove, and Market, and in the early 1990s, the statue was moved. 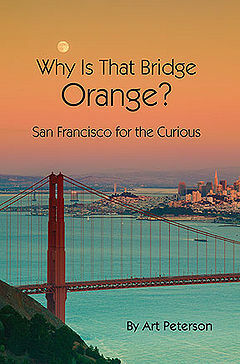 Excerpted with permission from Art Peterson's book, "Why Is That Bridge Orange?" published in 2013, by Inquiring Minds Productions.